Watermelon is the top choice of fruit for ghetto people. Ghetto people prefer watermelon because it is cheap, juicy, sweet, and appealing to the eyes. While Black people are stereotyped for eating an abundance of watermelon, also known as n*gger apples, the truth is that watermelon is the fruit of choice for most Americans. Black people might find this post offensive but let’s keep it real. When you go to a BBQ thrown by Ghetto and educated folks alike, what fruit do you usually see? WATERMELON. Watermelon is usually the first thing to go, even before the chicken! There is nothing wrong with liking watermelon but racist and ignorant folks have made it taboo to enjoy a delicious succulent piece of watermelon on a hot summer day. Personally I love watermelon and usually eat it every day during the hot summer months. Watermelon is an excellent source of water and Vitamin C. Watermelon also makes an excellent margarita! Besides, what else goes with BBQ chicken and potato salad? For whatever reason, watermelon enhances the taste of chicken and no one should feel ashamed for enjoying this delicious fruit! UPDATE: Speaking of watermelon, please bump and download this song right here! There are several devices the human species utilizes to express themselves and get their point across during a conversation. For most people, raising the pitch of one’s voice, and hand gestures would suffice, but ghetto people are a little different. Speaking loudly, snapping one’s neck/teeth/lips to punctuate sentences, and the sprinkling in of curses, obscenities, and slang for emphasis may come to mind, but ghetto people are far more complex than that. Ghetto people have come to depend on small, yet effective hand decorations that not only look great, but also exaggerate their hand motions to help their listener to better comprehend their message. Hence acrylic nails with intricate designs. While acrylic nails have been around for ages and are worn by nearly everyone, only ghetto people have mastered how to use them to maximize their effectiveness in day to day life. Only a lime green, three inch long acrylic nail with rhinestones and a piercing could catch the attention of a man with a straying eye. That is why you can often spot a ghetto female pointing and clicking her nails while reprimanding her cheating man. When he sees those nails flicking rapidly and clicking, he knows trouble is astir. Nails can also be used to elicit fear into the hearts of young children. Kids tremble at the sight of a pointed finger adorned with intricate nails, because strength and size of the hand that is about to whip them is emphasized. This breakthrough in communication has garnered so much success for ghetto people, that sometimes words are not even necessary. This form of communication is comparable to sign language. A beginner can tap her nails against a hard surface to show boredom. A ghetto observer will notice the nails and pay more attention resulting in both ghetto people no longer being bored. At the intermediate level a ghetto person can alternate the use of nail clicking, neck/teeth/lip smacking and multiple sighs to express anger to onlookers. But a fluent ghetto person can convey every emotion, be it excitement or rage, with a simple point or hand flip. This is very impressive. If you find yourself unable to understand a fluent ghetto person, do not panic. 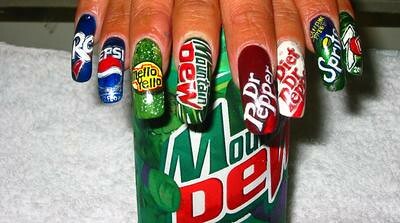 Try complimenting her nails and saying, “Wow. I never thought of that!” No matter what she was talking about she will like you because you like her nails. However, if you suspect said person may be upset, do not try to diffuse the situation by commenting on how beautiful her nails look. She may become irate. Try instead to focus on where she is pointing and study her hand motions. When, and only when, she notices you understand and calms down, try saying “You have a beautiful way with words… Hey, nice nails!”. You will have won yourself a new friend. That terrifying scenario is the principal reason why ghetto people love to announce to the world that they are part Cherokee. * Even if he or she has no knowledge of their genealogy, or is simply lying, claiming that their great great grandfather was Cherokee will make them appear more datable and exotic. Ghetto people love to feel exotic. Because many people have not even seen an actual Native American before, it is the most easy race to use. The perks are infinite. Suitors will flock and potential baby’s mothers/fathers can rest assured that their future children will probably be cute with “good hair.” Even the least attractive ghetto person can come at least 2 points closer to being a 10, if they say they are part Cherokee. Another perk that comes along with mixedness? Once the entire hood has been informed, a part Cherokee ghetto person can partake in exclusive activities such as wearing a jet black, bone straight, waist length weave, or adopting a screen name like PokAho69 or mochaHontas10. These actions are only acceptable when a ghetto person says they are part Cherokee. **The Cherokee tribe owned African slaves, just as Europeans did.